Erin is an educator, artist, and writer living in Southern California. She has facilitated PoetArt™ workshops for children ages preschool to ninth grade for over twenty years. Working within the realm of images, both verbal and visual, is one of Erin’s most pleasurable pastimes. She creates mixed-media pieces inspired by dreams or moments in time. 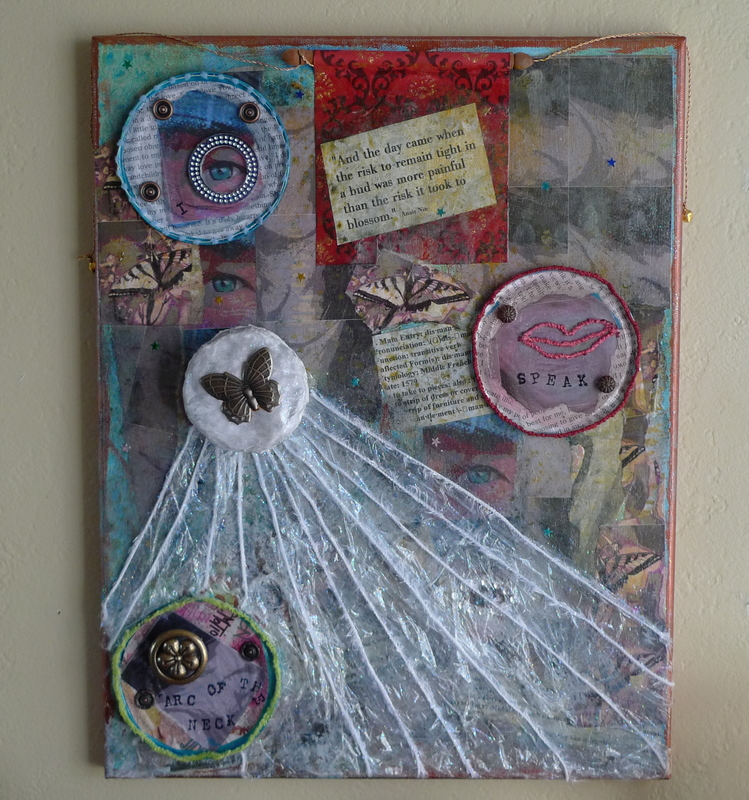 Using her own altered photographs as a focal point, Erin builds her pieces using paint, ink, adhesive, metal embellishments, handmade paper-maché objects, stamps, ribbon, and text. Each piece pays homage to a single word. Inspired by the book Qualities by J. Ruth Gendler, Erin often writes accompanying personifications to compliment her artwork. She also creates tin can lid books and mosaics. On occasion, these items may show up as special guests in her posts. Please let Erin know if you visit and leave a comment. She will be happy to respond and hear about your own work or blog. It makes me happy to know you have a mosaic with you in Ohio. : ) Thanks again. Your support means so much! I finally got here and wish I could linger all evening. You have such a gift. I absolutely love the mixed media art on the “about” page. I’ve read delight -how to convey the fun of reading with my word handicap? Will visit again soon! !